Side Return Extensions are generally used on older Victorian/Georgian style homes were extra spaces were added to the rear of the properties as housing demands increased. The left over passage to the garden area is often an underutilised and narrow space used as storage. By extending the rear of your property to incorporate this passage into your home's envelope you can open up your downstairs living spaces and kitchen to improve your access to the garden. The use of glass in these small renovations is hugely important. As you are generally extending out to meet the party wall in most terrace houses you will lose any side light you had achieved through the original wall. 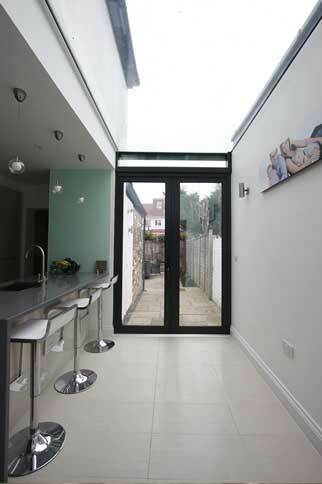 In this instance using a large glass roof over the whole area will maximise your natural light influx and create a much lighter space than you had previously. By introducing a side return extension to the rear of the property you have to also now change your access point to the garden. This is normally a great opportunity to introduce as much glass as possible to the rear elevation of the home. Moveable glass elements such as minimal windows sliding doors or sliding folding door systems will allow you a much better window to your garden and will then create the ‘indoor-outdoor’ effect at these points, further extending your home through the garden space. Using flush floor finishes with these opening elements will make this interchange between inside and out much more seamless and greatly improve the connection to the garden, making the outside space more accessible. These relatively small renovations and extensions can make a huge difference on how you use your home and space, and the introduction of clever glazing can greatly improve the usability and draw to the rear section of the home.